Balanced Scorecards (BSC) is a strategic system for planing and management which companies around the globe adopted as a key-frame for sucssesfull business . BSC is clear link between business strategy, processes through which that strategy is conducted and key performance indicators (KPI). BSC gives an overview of a company through four different perspectives: buyer/user, financial, inner business processes and upgrades, and development. Therefore it is necessary to evolve mechanisms for gathering and analysing data from different sources, applications and subsystems which are part of a particular perspective. Data integration represents a problem in many IT systems and leads to partial reporting and manual data processing. Unefficencies like these are especially highlighted in small and mid-size companies which do not have great staff and IT capacities. Omnilogika offers integrated development and introduces BSC mechanisms by applying leading Oracle Business Intelligence platform which joins data management , advanced analytic processing and web-based information presentation. 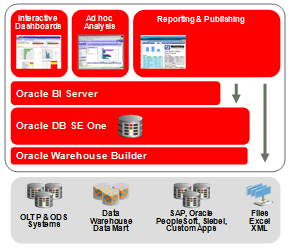 One of the crucial features of Oracle BI tehnology is the ability of automatic connection and data crossreferencing between different subsystems and applications from various vendors. In that way, incorporated and analyticly processed information are suitable for viewing throug rich graphical reports in web technology and in real time. Interactivity by ways of web technology is enabling easy movement throug sinthetics and analytics on every level of data. (sc. Drill-down). That way, it is possible to distinguish factors which have pozitive or negative influence on business performance. And all that is achieved from one intuitive tool, which is suited for business users and not for IT specialists only, maintaining company information confidentiality at all times. Oracle BI technology is a leader among all competitors and it is aknowledged world wide. It is clear that technology like this has its price. Still, for small and mid-size companies, Omnilogika and Oracle are providing customized OBI SE1 package which enables the most effective way of benefitting from this enterprise-level platforme at a very affordable price. You can start developing modern business analytics and performance management system which will be cost-efective and functionaly sustainable thanks to the fact that it is based on recognized methodology and leading technology.